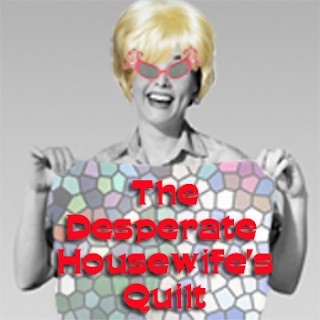 I'm joining in the fun of The Desperate Housewife's Quilt, currently being hosted by Quilt Jane. If you haven't joined in, there is still plenty of time. 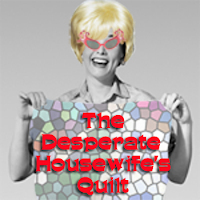 There is also a Flickr group dedicated to this quilt a long HERE. This week, I'm sharing a block tutorial using the raw edge applique technique / machine applique. I've received emails with queries, in regards to the style of applique I use, so here is a step by step of how I do it. Just before we get started, this isn't the only way to do raw edge applique, but it's the way that I do it, and it works for me. Firstly get your block backing fabric ready - I've used a roughly cut 8.5" square of kona cotton in white. Next step is your design. I've just made up a very basic funky flower design but really, you can applique just about anything - Hint: Kids colouring pages on the internet or colouring books are a great resource for inspiration. Now you'll need some vliesofix. Vliesofix is a double sided bonding paper. I'm sure there are other brands available, but this is the one that I buy at my local quilt store. You're tracing each element of your design separately. In this instance, the flower outline is drawn and then the flower centre is drawn. Cut them out leaving, at lease 1/8" outside of your pencil line. Place the designs with the sticky/rough side down onto the back of your chosen fabrics. 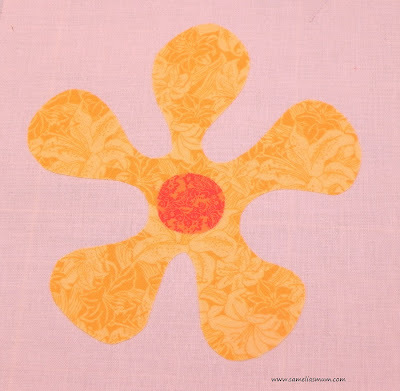 This method of applique is fantastic for using up scraps. Press with a hot, dry iron. Cut out your design on your drawn line. Peel the backing paper and place it onto the white block background - Hint: do this on your ironing board so that the individual pieces don't move or float away when you move it. Once you're completely happy with the layout, press with a hot iron... and there you have your design fused onto your backing block - ready to do the final stitching. Now for the stitching to finish off your block and secure the design edges (and stop fraying). You can either blanket stitch by hand, or machine stitch. Depending on the design, sometimes I add my darning foot, lower the machine feed dogs and just free motion stitch along the edge with a straight stitch - I like the contrast of a charcoal or black thread. In this block, I've used co-ordinating thread and a very small zig-zag stitch (1.5). Go around your design slowly ensuring you zig on the design and zag on the backing fabric. Trim your block so that it's 8.5" square and there you have a finished funky flower block. I think this style of block would look great in a quilt. Use it as an alternating block with some fresh bright fabric squares. Very cute....I love the added quilting stitches. Vry beautiful funky cushion.You are really talented. aaaahhhh...not a gingerbread man at all! How cute! Thanks for the tutorial! Love your pillow with the funky flower. So cute! Your block is absolutely gorgeous. I love the hand quilting and the extra mile you went into making it into a pillow. Thank you. Cute! Love the hand quilting around the flower. How cute! Love the additional hand stitching. O so very nice and cute. Fantastic!! Thank you. Now I just need the cushion tutorial!